If both the FLL and DLL bought today…how come the nifty sensex and midcaps corrected that much today…I dont think retailers can bring market down…any clues? @jamit05 - I am not a big fan of financial jargons myself. Will try my best to keep things very simple. Is it correct to think that, if Debtor days are increasing, then the company will be able to have that much lesser inventory turnover, and hence lesser operating profits, FCF and RoE. Inventory Turnover: Company should be able to have right inventory levels (because of debt) to support growth in sales. So no big impact at a high level. Operating Profits: No impact to EBIT or EBITDA. Increase in interest cost should reduce net profit margin. FCF: Lower net profit means lower FCF as some cash was given away for principal and interest payment. ROE: Lower NP but higher leverage should balance ROE and there should be minimal impact depending on the weightage of NP to leverage. As a solution, a company could use short term debt to fund the increasing debtor days and bring a balance to the other ratios. This will, however, affect the margins. Hence, if the nature of the business is such tht the margins are small to begin with, then taking on additional debt will not help the bottom line. As I mentioned above - one needs to check what impacts ROE more. Decrease in net margin or increase in leverage and to what magnitude. Can someone please point me to a resource where upcoming de-mergers can be tracked. Get all latest & breaking news on Demerger. Watch videos, top stories and articles on Demerger at moneycontrol.com. Since there is a lot of uncertainty in the market (and its still very expensive), I am thinking of parking my excess cash (viz about 10% of my total networth) in a liquid fund. Right now it’s in my savings account. I am thinking of putting it in a liquid fund for the next 2 months and will look to invest as we near closer to elections or maybe even post the elections. i have a home loan OD account with SBI and i always park my excess funds there. So, effectively, interest is only charged on the remaining balance of the homeloan. i feel so far this is the best method to use my liquidity and save EMI outgo. You can also look at liquid ETF, although i am not sure of its returns lately. For 2 months, why not let it remain in the savings fund instead? In that way you can quickly transfer it to your Trading account. Anyway, for that short period, I feel overnight funds are best suited. You can choose HDFC, ICICI, Kotak or SBI’s (with high AUMs). If it is just for 2 months, how much more would you gain in 2 months with liquid funds than with a savings account? If the difference to you substantial, then you can go with it. Also, credit risk always exists even for liquid funds, the NAV will fall, although it will regain fast compared to other debt funds, liquid fund of Taurus fell and investors lost money. Then there is redemption, there a few funds which offer instant redemption, but I think it is up to a certain amount and there could be redemption pressure if many redeem at a time. Then there is STCG. 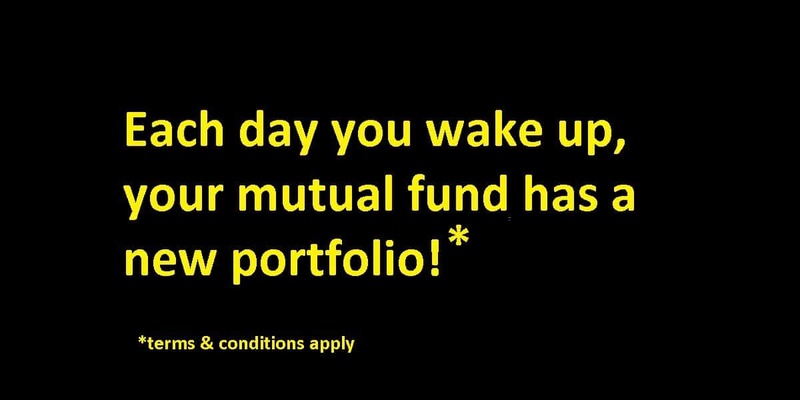 If you want to invest, then check for the highest AUM funds, so that they don’t invest much in 1 bond, and also the redemption will be fast, check if you can redeem as much as you want instantly. Invest in AAA rated bond funds. Hi, can anyone point me how to calculate intrinsic value of a company with an example? I tried to find it online. But it seems complicated. So any help or pointer will be appreciated. If it has already been discussed in any other thread, please point me to that. Thanks Dinesh. I will go through prof Aswath video first to understand the concept as I am not from finance background. So I might not be able to use excel directly without knowing the concept. If an individual or a fund owns <1‰ of the company say .46‰, will it show up on the BSE shareholding data( public)? I ask because I have seen such shareholders with values less than 1‰… if thats true then why do I hear that a fund shows up on bse only when it holds =>1‰? Show an example where it is less than 1 %, then it will be easier to understand your question. Normally the limit for mandatory disclosure is 1 %. 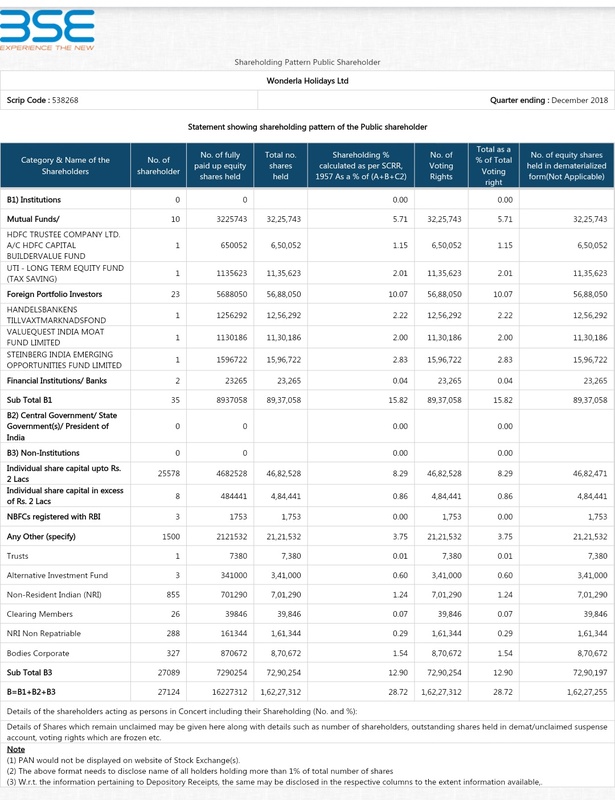 Refer above attached screenshot for wonderla Dec 2018 shareholding report as a sample… now my question is…would the mutual funds and foriegn portfolio still show up on this report if their respective holdings were less than 1%? would the mutual funds and foriegn portfolio still show up on this report if their respective holdings were less than 1%? My answer is No, they wont show up. If you see, 10 MFs hold is 5.71 % but only 2 are listed specifically. So the others hold less than 1 %. This is a category and not individual holding. There are 288 investors who jointly hold this much. 1 % disclosure is for an single investor and not category. Brilliant explanation. Thank you. Finally all my doubts are clarified. Sharing my investment framework here…feel free to discuss. Hello all how does comparing debtor days of companies from same sector help?does it shows any thing about quality of company product or management? It shows the pricing power with suppliers. A better metric to look at would be the broader Cash Conversion Cycle, which looks at the whole chain (Suppliers, Distributors and/or Customers). Great companies often have a negative or extremely low Cash Conversion Cycle. But like most things, it is all relative. If the industry average CCC is 12 weeks and a company can do it in 4 weeks, then its way better in terms on converting Revenues to Cash for the Stakeholders. http://www.ratestar.in/ shows Receivable Days, Inventory Days, Payable Days and CCC all in one place.